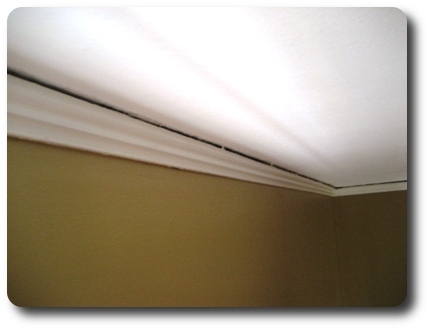 Older homes often have noticeable gaps between the top of the molding and the ceiling. Sort of like what you can see here. Older homes also often have plaster walls, making homeowners think twice about nailing picture hooks into place. Fortunately, the people that built the older homes devised an alternative strategy for hanging decorations – picture molding. Making holes in plaster is not ideal. Instead, a rail of molding is mounted on the wall so that pictures and other decorations can be hung, and moved, with ease. The molding is pretty strong, supporting either single larger items, or multiple smaller items. 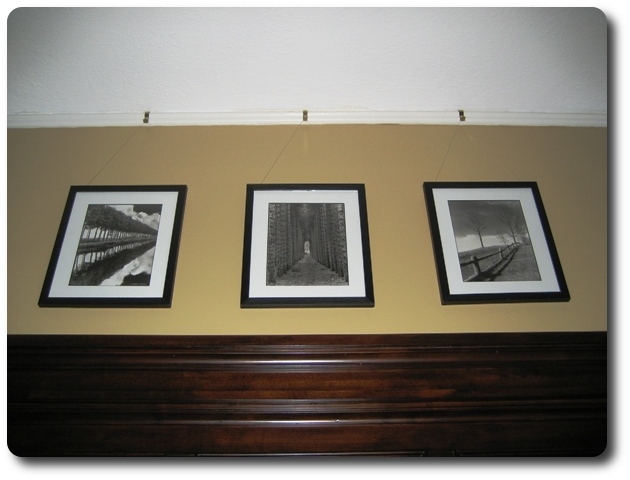 Here is an example of 3 photos hung together. 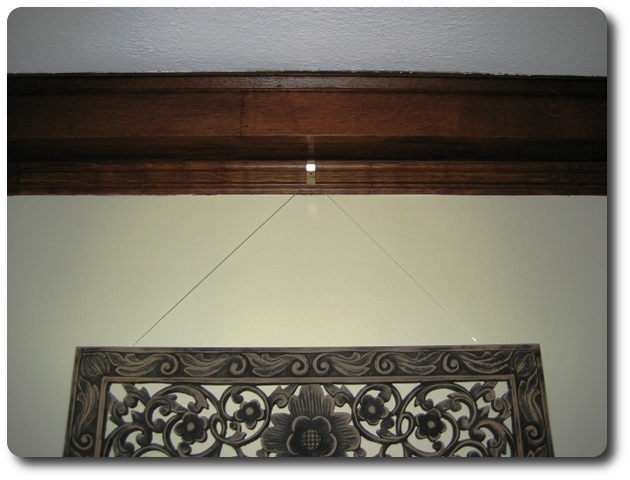 Picture molding can also be used in conjunction with crown molding, as can be seen here. Many people that buy older homes, especially if it is their first, don’t know that there is a solution to the decoration hanging problem already in place. They attribute the cracks near the ceiling to an older home settling, and they hang their pictures using nails or picture hangers directly in the wall just like they always have. Hooks to use with picture molding (Picture Molding Hooks) are available at most hardware stores and on the internet; we have bought them at Home Depot, Pfau’s, and Lowe’s in Greater Hartford. They are intended to be used with wire, which is also widely available. As you can see in the pictures, Kyle prefers to use high-strength fishing line, so that is also an option. Ha. I rented a very nice apartment in one of the 1920’s buildings on Girard Ave which had picture molding in each room, which I took advantage of to hang everything. When I was moving out a woman came to look at the apartment and told the managing agent that she would rent the apartment if “you will fix all those cracks over the crown molding”. The think I hate about where we live now is the lack of picture molding, so now I can’t rearrange my collection of wall art so easily. Yeah, the ease of moving art around with no consequences of patching/painting is easily the nicest advantage of the picture molding. My old apartment in Boston had picture rails all along the ceilings. It was the best. But it took a bit of digging to actually find the hooks to use. I received quite a few puzzled looks when I went into some shops. Thankfully, when we got down to West Hartford, hooks were easily found at Pfau’s. I have recently moved into a 1939 home with picture molding throughout the house. I disparately want to take advantage of it, but not sure of how strong they are. Does anyone have a rule of thumb as to how heavy of artwork can be hung on a single wall? Thanks! It most likely all depends on the type of picture molding you have and how it’s affixed to your wall. You might want to go up on a ladder and tug on the areas where you think you’d like to hang the artwork. From there you can understand how securely it’s attached to the wall and what load it might be able to withstand. We have two fairly large-ish paintings that hang near each other and are probably around 5lbs. each and it doesn’t seem to cause any issues. Good luck! I offer you my experience with fishing line: Almost 50 years ago I bought a Victorian house that had picture molding at the top of nine-foot-high walls, which allowed me to slip special hooks into a horizontal gap and hang art without marring the plaster walls. I got the idea to use almost invisible fishing line (strong enough to haul in 100-lb. tarpons) rather than braided picture wire in hanging my art collection—eight molas in double-glass teak frames, plus three framed original prints. One day some five years later I was in my living room when the line broke and the art all came crashing down, in the order in which it had been hung. I had the good sense to realize the reason and quickly ran upstairs, where a day or so after the living room installation I had hung six more molas in a hallway. I scrambled to take them down, saving them from the same fate as the downstairs art. None of the pieces weighed even ten pounds, probably more like five. What I concluded was that, just like metal fatigue, fishing line will give out after a certain period of time/stress. I’ve been using picture wire ever since.